Sharkoon reveals the T28, a new mid-tower ATX case weight eight hard drive bays, front USB 3.0 and room for graphics cards as long as 40cm. The MSRP is 54.90EUR. Sharkoon presents another series of cases: Available in three color editions, the Sharkoon T28 offers a lot of space especially for hard drive installation, thankfully due to the removable hard drive cage, and also perfect for extra-long graphic cards. Externally the Sharkoon T28 offers a black body and a rectilinear mesh front design. Power and Reset buttons are elegantly chromed. In regards to the front connectors, Audio In/Out stands ready between three USB2.0 ports and a USB3.0 interface. An acrylic window on the left side panel gives an insight into the interior of the colored mainboard tray. Choose from three color editions: Red, green, and for the first time after numerous customer suggestions, blue. Also, the operating and hard drive LEDs illuminate in the edition color as well as the three pre-installed 120 mm fans. Two fans rotate in the front, the third in the back. All possess a 4-pin power supply and a 3-pin mainboard connector. The Sharkoon T28 allows various options with the drive assembly: Two external 5.25 inch and eight internal 3.5 inch bays are available. In one of the two 5.25 slots an external 3.5 inch device alternately can be mounted, appropriate installation material is enclosed. 2.5 inch disks also find room: Configuration includes two mounting frames for hard drives and SSDs in both installation sizes. 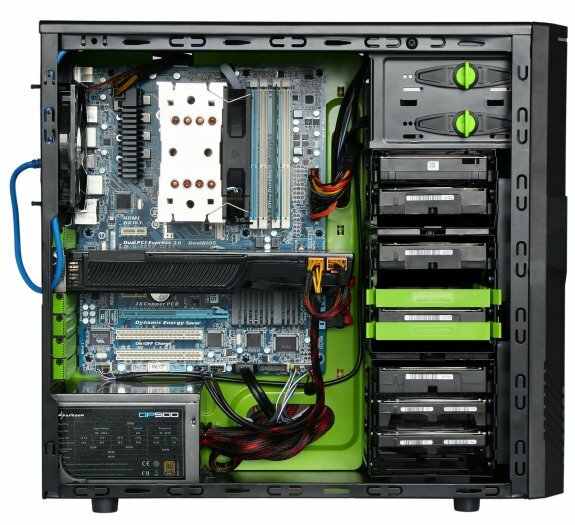 If necessary, the case converts in no time to support the installation of longer graphic cards: The eight hard drive bays are divided, with two firmly installed and a separate modular hard drive cage. By removing the middle three-cage, enough room is created for up to 40 cm long graphic cards. In regards to the other functions Sharkoon focuses on proven comfort: The mainboard tray is provided with a CPU cooler mount opening and feedthroughs for orderly and concealed cable relocation, the drives assembly occurs with practical quick-locking mechanisms, the power supply is positioned on the floor of the case directly over a dust filter protected air intake, and in the rear two rubberized hoses are provided. The Sharkoon T28 measures 475 x 200 x 440 mm (L x B x H) and weighs 6.6 kg. The maximum CPU cooler height averages 16.5 cm, the maximum power supply length is 29 cm. End customers will find the Sharkoon T28 case available immediately for the suggested manufacturer's price of 54.90 euros from authorized retailers.